Like me, I'd imagine a lot of you are still on the feel good roller-coaster following Sunday's victory. It feels so good beating Manchester United. I'm sure the players feel the same. It just leaves the thoughts of what might have been though. This week looks set to be a very interesting week off the pitch. Stan Kroenke has to send out the formal proposal documents to the remaining Arsenal shareholders with the offer he's making to buy their shares. The American already owns 63% of the club having snapped up the holdings of the late Danny Fizsman and Lady Nina Bracewell-Smith. Add to that the stock owned by members of the board and I believe he'll be pushing at 67%. Small share holders will be receive the formal offer document. But they don't have to sell and I would urge them not to. Arsenal is far too important to every Gooner for the club to be owned by one person. I will be voting to keep my share of the club. And if you are yet to sign up, so that you too can own part of the football club you love, I'd urge you to do so. Arsenal Fanshare is an awesome scheme and means all supporters can own a piece of the club in a very cost effective way. The club also look set to announce how much they plan to raise season ticket prices to for next season. Personally, I'm dead against any rise and I've already posted how I will take measures to reduce the amount of money I spend on club goods and services if an increase of anything more than 2.5% is implemented. It will be interesting to see how and when the announcement is made. I hope the board has seen sense but I fear they'll try and force the increase through. Back to matters on the pitch and it was great to read in the matchday programme the impact Jens Lehmann is having on Wojciech Szczesny. 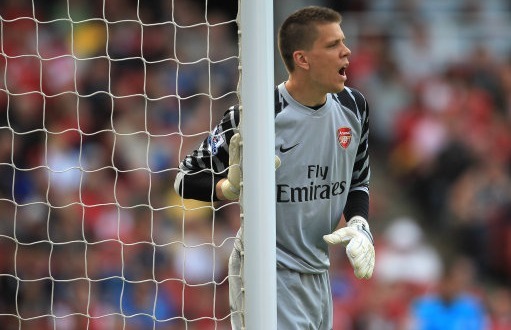 The Pole has revealed the talks the two goalkeepers have after games and how Lehmann is pinpointing the ways Szczesny can be a better keeper. "After every game he talks to me in great detail. He also takes me to one side at training, or when we're doing some stretching, and gives me advice about little aspects of my game. It's not about the big things, because I haven't made many massive mistakes, but he spots little details and uses his experience to help me. "That's really useful and I'm very grateful for it. It's been enjoyable, and I'm looking forward to working with him more because I do learn a lot from him. "He definitely has the qualities to be a very good coach - he has an ability to give out information in a very clear way, so that you can understand all his advice." Reading Szczesny speak like this makes it all the more frustrating that Arsene Wenger has this policy of only offering players over the age of 30 one year deals. For me, it's what we're lacking at the moment. These types of players to pull us over the line and it just makes it all the more frustrating. I wonder whether Lehmann will be around next season. He's obviously been a huge bonus to have around the club and needs to get his coaching badges. So perhaps he might just remain at the club? Elsewhere Szczesny has said all the players are behind Arsene Wenger remaining as manager and says Cesc Fabregas would be mad to leave the club. Two points I can't disagree with. Former manager George Graham made an appearance on Sky Sports' special edition of Goals on Sunday yesterday and was asked about the changes he would make to the current Arsenal team. Unsurprisingly he picked out the defence as our weakest area. "Arsenal need defensive-minded centre-halves. The full-backs like going forward. "When the opposition get the ball Arsenal are vulnerable. The centre-backs they have look like midfielders." I don't agree with his argument. Personally I believe where we are lacking is in the defensive midfield role. You can see how well we can defend when Alex Song plays well like he did at the weekend against Manchester United. But when he isn't playing at 100% or out injured, we don't have a player who can step into his role. To me his place in the squad lacks competition and this is an area I'd like to see us strengthen during the summer. The Daily Mail take up the baton of the story I brought you on Sunday from The People about 14-year-old Anderlecht midfielder Charly Musonda. He and his parents were at the Manchester United game and given the full VIP treatment by Arsenal. Wenger is obviously very keen on snapping this player up. It appears all our worst fears about Jack Wilshere not getting a summer off to recover from his first full Premier League season will be realised when Stuart Pearce names him in his provisional squad to play at the under-21 European Championships in Denmark. And finally, congratulations to Henri Lansbury who was part of the Norwich City team which was promoted to the Premier League last night. I was taken to the game by a good friend and met Henri after the match. Top bloke and I hope an Arsenal star in the making.